Awarded a Finalist Medal in the Next Generation INDIE Book Awards. “The Heliotrope Fly With The Suction-Cup Feet” (a real smartypants who gets her comeuppance in the end) thus took a starring role in the first of The Childornot Tales. From there came other tales, featuring a range of characters – all different, all intriguing, all asking the reader to involve their “theater of the mind” for maximum effect. For the second tale, most of us know what it’s like to be told by our elders that we have “nothing to fear” and to run off to bed … down that long dark hallway … into that empty room … when we know all too well that “Nothing to Fear Could Be Lurking Quite Near” – under the bed or in the back of the closet. Perhaps we’ve also experienced what it’s like to be thought too tall or too short or too fat or too thin or too this or too that to be friends with all the others. The third tale shows how “Some Swell Mutant Ants Holding Hands As They Danced” know quite a bit about diversity. Each of these stories is meant to entertain … and to deliver a tiny, albeit important, life lesson – without actually being caught at it. All of the tales begin with a highly visual, rather improbably, multi-layered illustration to set the stage for the story to follow. Each fills the mind with “possibilities.” Every illustration is a one-of-a-kind, carefully hand-cut creation by artist Cindy Johnson – created specifically for the tale it begins. Within the story, bits and pieces of the artwork are utilized to further the story line, but leave the rest up to the reader to imagine at will. The stories were written first. Then, the author and artist worked closely together to create just the right balance of “hauntingly realistic” with “highly imaginative.” A sort of “steam-punk” approach resulted. In the hands of designer Barry Doss and production artist Kim Noah, the stories came alive. “The Childornot Tales” in this book ask the reader to “be nice, be brave, be different,” and will charm and engage a variety of audiences and generations. This book is so new it is still out being reviewed! They will be coming soon. 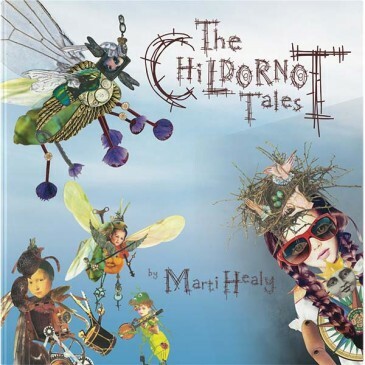 You, too, can submit your own review of this or any of Marti Healy’s books: submit a review directly to MartiHealy@MartiHealyBooks.com (see Contact page).